Walking into 999.99 (Five Nines), one would immediately be drawn to the warm-bricked walls at the side, its gold decor, the huge light bulbs, and the generous bar. Granted, there is an extra oohmph to the place, perhaps because of its striking combination. There is enough gleaming elegance to term it as high-class or fine dining, but the smooth zing of black and/or a “hipster” attitude undermines any dated ideas and instead subverts it into a modern choice – luxury at affordable prices! Cooking for us that night was Chef Masanao Saito, whose culinary experiences shone through the many dishes. With a background spanning Japan to Sweden and now Singapore, we confess that we weren’t too sure what we were in for. A mix of Japanese influences with European dishes might sound familiar, but the first dish was enough to get us asking questions (and wanting more). 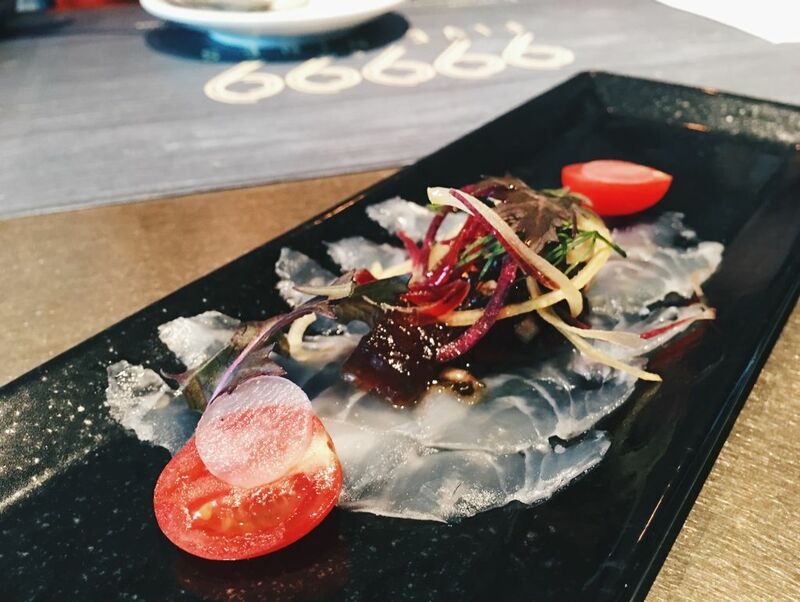 One of the better carpaccio dishes we’ve tried in Singapore, the translucent slices of seabass were fresh and went well with the jelly sauce. The jelly itself is an interesting concoction of truffle and ponzo, giving it a tangy twist at the end with a generous truffle afternote that will please truffle lovers. It became a surprisingly refreshing and neat appetiser, and the plate was soon left very clean. We hear you: burrata at only $14? That’s half the price of what normal restaurants would ask for, and yet quality is not compromised at all. 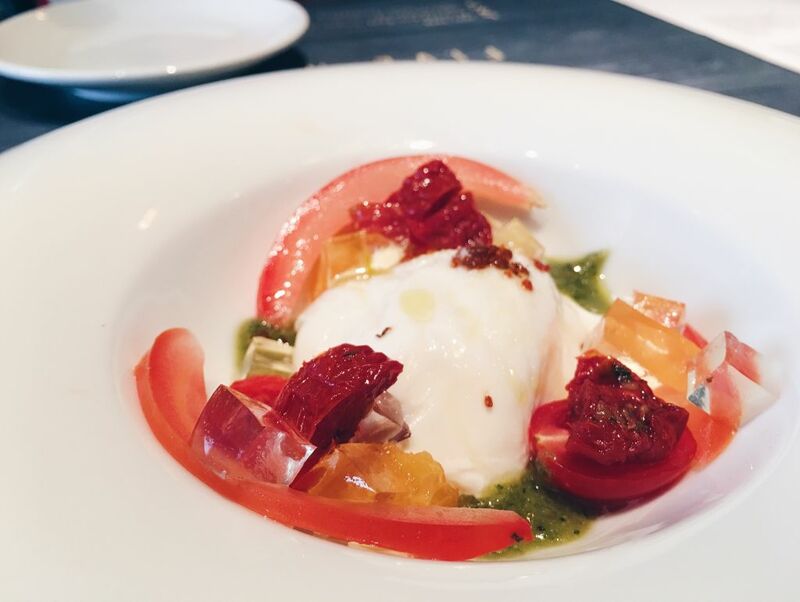 The burrata is light, soft and creamy, and perfectly complimented the salty nature of the tomato jelly and sun-dried tomatoes. To top it off, the mildly spicy pesto sauce balanced the overall flavour and allowed one to keep mixing the dish around for new flavour combinations. This is the one bar food that is a must-have for group sessions. Crispy breaded exterior housing an impossibly creamy and soft filling, the croquettes won us alone by its sinful appearance. 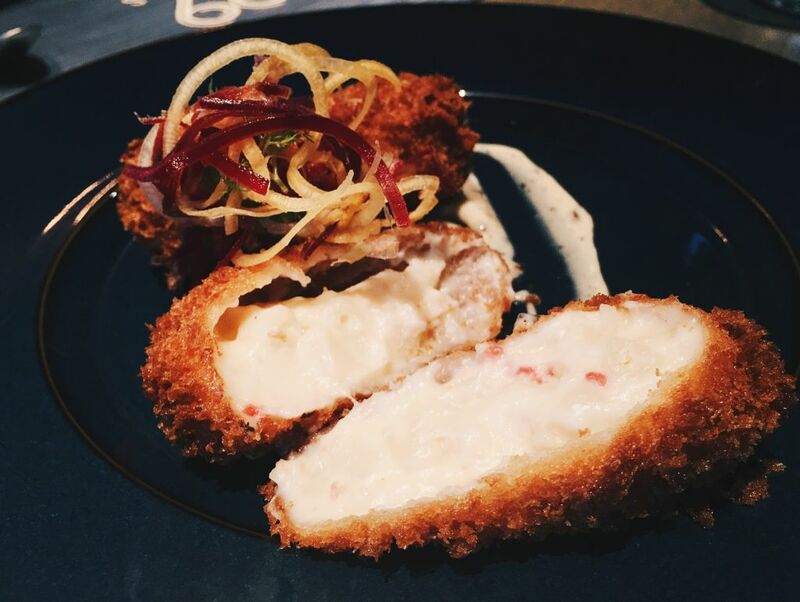 Although the taste of it can be a bit gao once you get pass one whole croquette, the filling is much lighter than the usual cream fillings, but understandable seeing how it’s mostly soft potatoes and king crab. The latter was a little hard to find amidst the cream, but nothing to sneeze at for $13. Oysters. 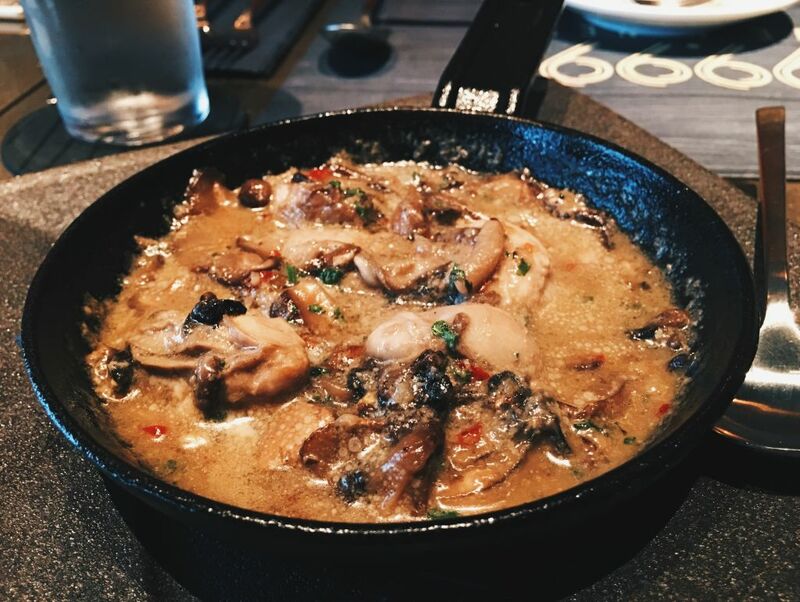 We like ours to come in shells but when it comes in a pan with mushrooms and garlic buttered sauce, we’re not sure anymore. This dish is definitely more Asian than its counterparts, but we’re biased towards oysters. It was more spicy than buttery (you know, with that salty note), so perhaps an extra dash of salt will really bring it up a notch. The Scallops & Cauliflower is one of the more expensive appetisers in the list, so unless you’re a huge fan of pan-seared scallops with a dash of cauliflower sauce (and little babies on the side), it is nothing particularly outstanding. 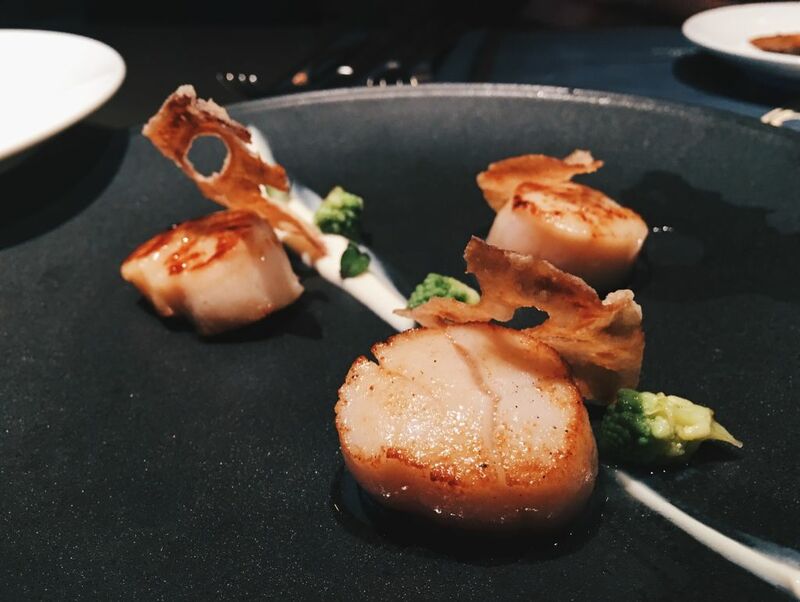 But we can’t fault the taste because the scallops were extremely fresh and tender, a fun contrast to the lotus crisps balanced precariously on them. This was the star of the night for us. The foie gras seared to perfection, creamy in texture, oozing its fat out with every cut, a delightful melt-in-your-mouth moment. Now step back for the tenderloin itself. Served medium rare, with every cut soft and red, with the lightly-charred bits on the outside to give it a smoky bite. Now, combine both with the creamy potato purée and spinach drenched in all the steak juice, liver fats and red wine sauce. A clear winner. Another hit. What can possibly go wrong with a whole Boston lobster for less than $30? 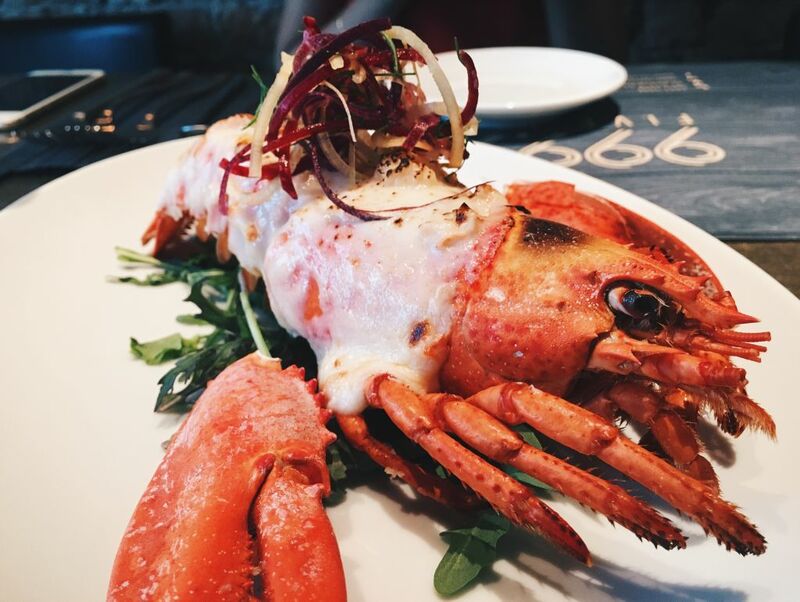 We thought it would be a rich cheesy hit, but the crunchy lobster meat packed into the shell were generously coated with more of a béchamel sauce to allow the nature of this seafood to ring true. While we were enjoying this, we were informed that the first 20 orders each day will go for only $19. That’s right, $19 for your personal lobster. 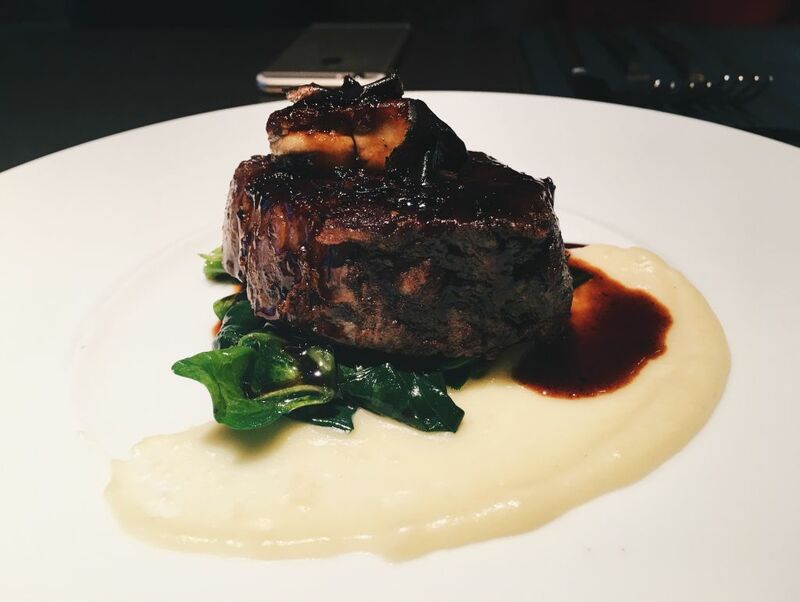 This dish didn’t fare very well with us, especially after we had the flavourful tenderloin. The fish was cooked a bit too well, turning it chewy and hard. 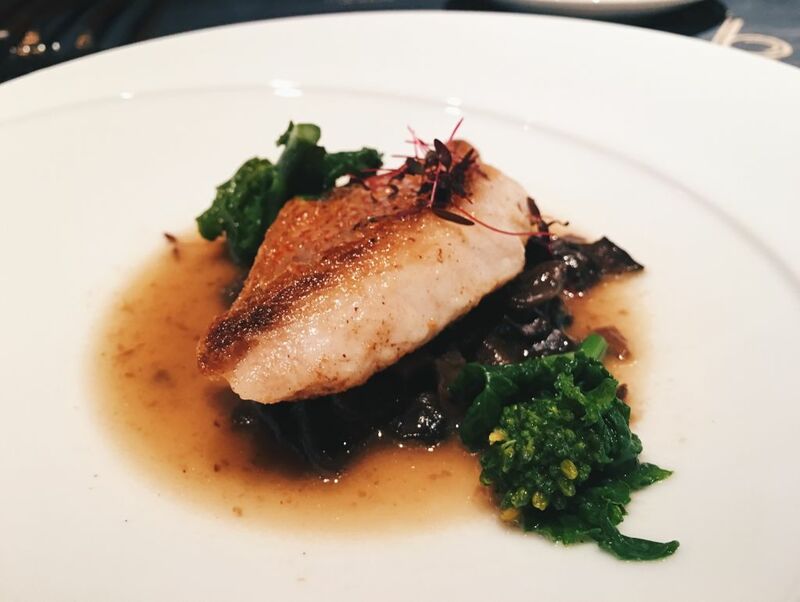 The broth also lacked a certain distinctiveness, and the only interesting part of the dish turned out to be the mushrooms hiding at the bottom of the fish. Surprisingly (and it was a surprise because we couldn’t differentiate any colour or type from the blackened pile), there are 8 mushrooms in total: yellow boletes, oyster mushroom, black fungus, shitake, enoki, shimeiji white, shimeiji brown, and white button. After everything, we were worried that desserts may turn out to be heavy and rich. However, the Japanese influences were a bit more distinct here because everything turned out to be light – but not at the expense of the flavours. 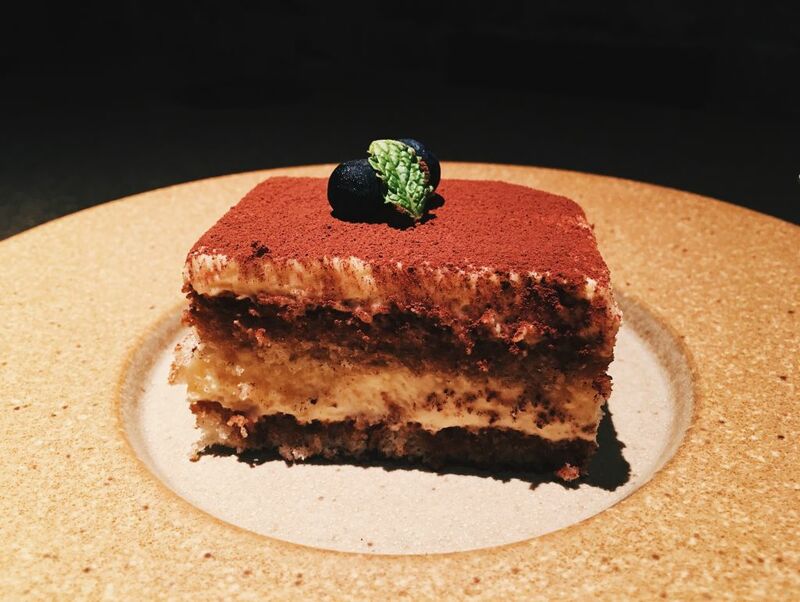 The tiramisu is a delicate balance of liquor, coffee, sponge cake and cream, making it strangely addictive. The tenderloin + a slice of this = our dinner for next few weeks, please? Citrus is always welcome at the end of every meal to refresh the tastebuds and act as a zesty digestive aid. 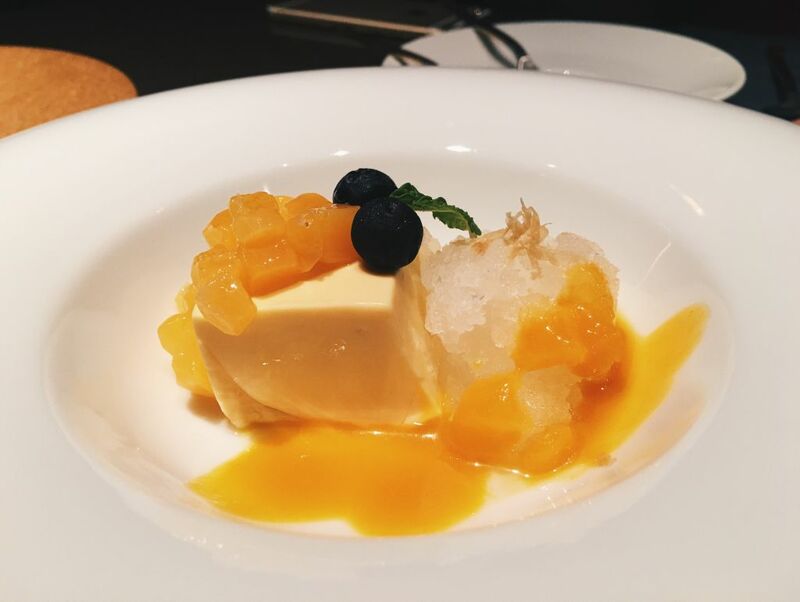 The sweet panna cotta itself has a nice bite and aroma, and coupling it with the tart sauce makes it go down smoothly after the big meal. The best kind of panna cotta isn’t slimy, but instead a nice balance of bounciness and firmness that is able to support the fruity bits and hold itself on the fork. On the outside, 999.99 (Five Nines) may seem like your typical pricey newcomer to the block, but it does pose itself a serious contender for your next dinner choice. Throughout the meal, we were made to guess the prices of the dishes and we found ourselves giving prices that we thought were acceptable — but turned out wrong. Quite a few of our guesses overestimated the prices, such as $35 for the steak as compared to its less than $30 pricetag. What does this say about our usual standards of living? We are used to paying a lot more just to get good food, so what would we expect to pay for exceptional food? With a name that mirrors the highest level of gold in the world, maybe this restaurant is here to set the gold standard of the street.